Reliable, tough, does exactly what its supposed to. Carry water. 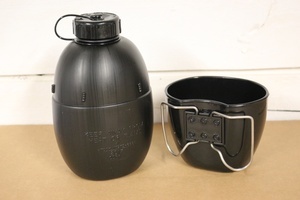 The BCB (not NATO Osprey) bottle will fit perfectly in to the Crusader cup, so as to take up as little room as possible. It comes with its own tough plastic (wing handle) cup as well. Bottle carries a liter of water. Purchase through PayPal by using the "Add To Cart" button above or use the form below to order the BCB water bottle and cup . Feel free to contact us if you have any questions about the BCB water bottle and cup .